As you know my gal loves gardening, & she couldn’t wait to get her hands on the seeds! 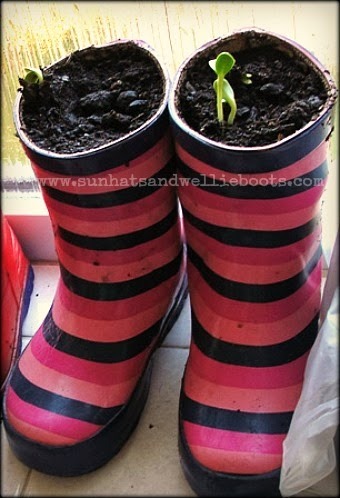 She planted them in her old wellie boots & we set them on a windowsill so we could watch their progress daily. The wellie boots proved to be quite a talking point with visitors! Soon the sunflower seedlings were growing fast, & once the risk of frost had past we transferred them to Minnie’s garden. The tallest now measures 198cm & the others are catching up fast! 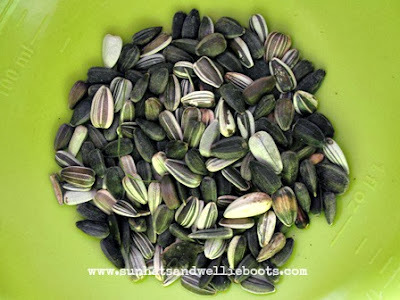 I’m hoping we'll be able to do some activities with the sunflowers once they are in full bloom, but for this activity Minnie & I thought we'd use some old sunflower seeds gathered from last years sunflowers. 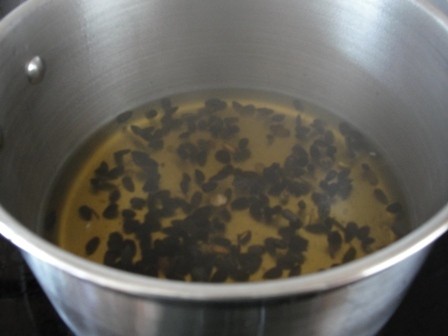 We added the seeds to a pan of simmering water. Minnie enjoyed watching the colour of the water change as the seeds swirled around the pan. Once it was cooled & we'd removed the seeds, the remaining liquid was a 'dirty' green colour. This is what we needed to make our Sunflower dye. I'd bought a 'Dylon Easy Batik Kit' a while ago & thought we’d try it out with this sunflower dye. 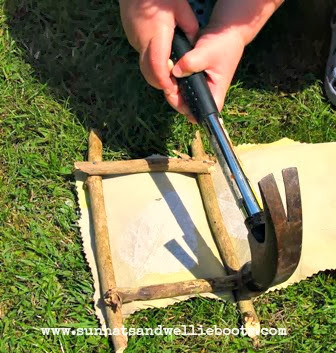 I love the effect batik art produces, & this easy batik kit was a great alternative to using the traditional method. For our fabric we cut up an old babygrow. 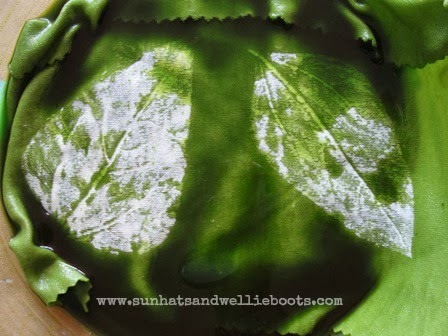 Minnie chose a couple of sunflower leaves from her plants & painted the back of each leaf with the batik paint. 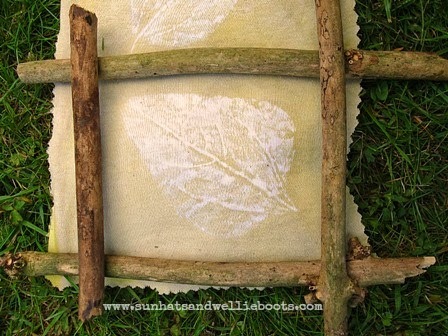 She pressed these firmly down on our fabric, & then gently lifted them to reveal her leaf prints. We set them aside to dry for an hour or so. Once dry, I ironed over the fabric to set the paint. 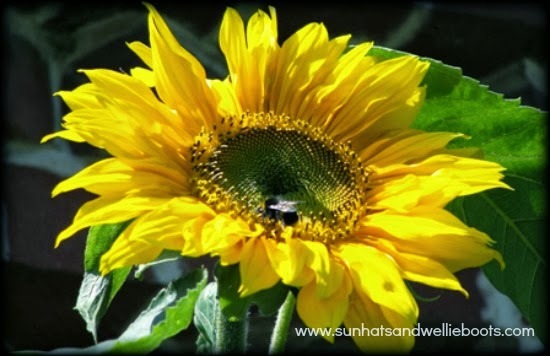 Minnie then dipped the material into our sunflower dye &amp; the instantaneous result was magical! We left the fabric to soak over night, & then left to drip-dry outside. 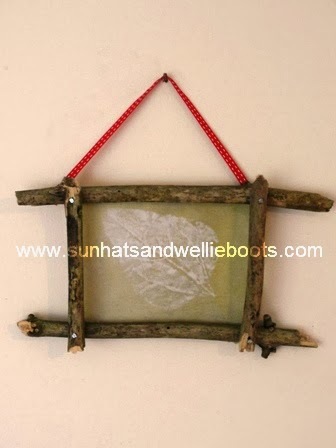 Minnie’s love of collecting sticks & twigs gave me the idea for the frame. She set off on a stick hunt & chose four sticks of a similar length. She then nailed these together (with a little help) to create her frame. I trimmed the fabric around the sticks & added a ribbon to hang the frame. 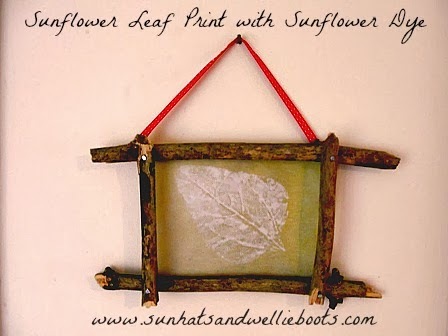 Using drawing pins we attached the fabric to the back of the frame, & our sunflower leaf print was ready to display! Nature is such a beautiful & colourful resource, something my little girl is just experiencing. :-) Nothing was wasted with this activity, the seeds that we used to create the dye we gave to the birds, & the remaining sections of babygrow have been turned into dusters!